就在 Java 成為 C/C++ 之外主流 Programming 課程使用語言沒幾年後, 對於 Java 適用性的討論也逐漸開始, 主要以興起的 Scripting Languages 為挑戰對象, 其中又以 Python  以及 Ruby  為多. 大部分的 Papers 是以 Languages 的特性去論述改為使用 Scripting Languages 的優點, 以及目前使用 Java 對於學生太過複雜等. 不過通常這些特性與實際學習上的影響之間, 有甚麼樣的連結很難說清楚, 而透過問卷對於學生的調查, 通常又受限於問題內容的表達方式, 使得調查結果是否能反應特定的問題有所疑慮. 這是很具體的比較, 就我之前當 T.A. 的教學經驗, 其實學生最困擾問題之一是, 在沒有面對任何 Programming Languages 經驗的情況下, 一下子就要弄清楚一段程式碼文字, 裡面一堆不認識的詞彙. 想像如果我們在學英文時是被要求直接看一段英文段落來學, 即便已經知道單字了, 也會是很痛苦吧. 另外在  中, 也利用一小段落說明 Java 比較適合作為 Second Programming Language to Learning. 基本上我同意這樣的意見, 但是目前似乎在 Python 到 Java, 或是 Ruby 到 Java 之間, 沒有為 Novice Programmer 去探討在 Syntax 以及 Semantics 之間的銜接, 以降低兩個階段之間轉移的 Learning Curve, 同時讓 Student 知道學習不同的 Programming Languages 之間, 可被轉移 (Transferable) 的學習經驗. 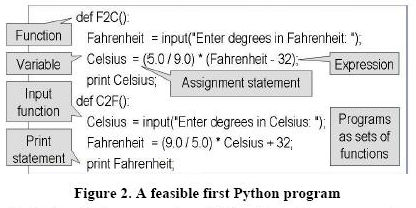 This entry was posted on 上午10:31 and is filed under paper review , programming learning , python . You can follow any responses to this entry through the RSS 2.0 feed. You can leave a response, or trackback from your own site.